At Copperloy, we always enjoy showcasing some of our recent projects, and the happy yard ramp customers and clients we work with across the country. Of course, each customer is important to us, and we take great pride in helping all of them to complete their jobs safely, effectively and efficiently. As an American owned company, proudly producing all American made equipment for more than 60 years, certain projects hold an extra-special place in our hearts and minds though. That includes any time we work with other small businesses looking to get ahead all across the United States. In this case though, we’re extremely excited to have been involved with the construction project surrounding the World Trade Center in Manhattan. Few symbols are more powerful and patriotic than the new Freedom Tower and the rebuilt WTC site and memorial, and everything that it stands for in the USA. Here, a World Trade Center contractor utilized one of our mobile yard ramps to help them move and install huge marble slabs in the WTC Transportation Hub. Gem Construction & Restoration Corp. won the interior stone contract, which meant they were handling the stone purchase and installation for the facility, and needed to outfit the upper Transit Hall and lower level Transit Hall. We provided them with one of our feature-rich and durable 16,000 lb. 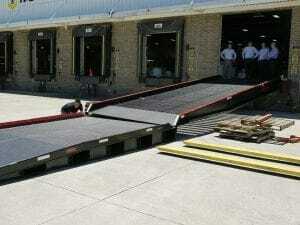 capacity steel yard ramps. These yard ramps offer an overall width of either 70 or 84 inches, with a height range of 37 to 65 inches, and a length of 36 feet. They offer steel grating, 6 inch steel curbs, an 8 foot level off, 15 inch lip and 30 inch approach ramp, pneumatic tires, an hydraulic pump, positioning sleeve, safety chains, and more. The list of features go on, but what remains will be all of the essential functionality and capability necessary to complete any tough and important job. Even one as tough and important as being involved with the construction of the World Trade Center. Copperloy produces a diverse array of material handling and loading dock equipment, and we have the gear you can count on. We also provide our customers with custom design, fabrication and manufacturing services. Call our team today at 800-321-4968 for any questions, or to learn more about all of our great material handling equipment and how we can help you and your company solve any difficult challenge. At Copperloy, we’re always proud of our completed custom jobs. That’s because we’ve been able to step up to the plate facing a very specific and typically difficult challenge, and then deliver the client a unique piece of loading dock or material handling equipment which gets the job done perfectly. The latest example of this is our work with Frontier-Kemper, a contractor who’s involved with the joint venture project undertaken by New York City’s MTA to complete the Eastside Access Queens Bored Tunnels. The ultimate goal of the project is to bring the Long Island Rail Road to the new Eastside Station which will be incorporated into Manhattan’s Grand Central Terminal. As you might imagine, this is a massive undertaking. Four separate 19-foot 6-inch diameter tunnels must be constructed. Together, the four tunnels have a combined length of 10,500 feet. Frontier-Kemper needed a heavy duty piece of equipment which could manage the huge loads of equipment and supplies they deal with on a daily basis. They needed efficiency, safety, effectiveness and durability, and that’s what we were able to produce. The end result is a 40,000 pound capacity steel material handling pallet structure. Not only is the capacity above and beyond a standard piece of equipment, but we also provided a unique system to hold down the gear being moved utilizing ratchet straps and fork pockets. 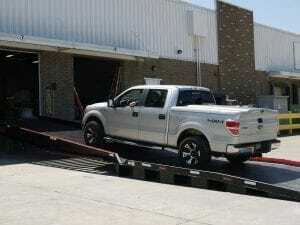 In this way, the system is similar to that of a flat bed truck. It’s tailor-made for Frontier-Kemper, and it will be in action for them on this project beginning on October 23rd. At Copperloy, we have a 70,000 sq. ft. facility to deliver custom feel fabrication projects with our own in-house engineering team and all of the latest and best high-tech equipment and designing tools. There’s no project too big, unique or seemingly challenging for Copperloy. As always, everything we produce is proudly made in the USA. We have a 50 year track record of meeting and exceeding the needs of our clients, and we’re ready to help you with the rigorous demands and unique challenges you’re facing. We produce a full range of loading dock equipment, from mobile yard ramps to dock lifts, edge of dock levelers to portable platforms, and so much more. Give us a call at 800.322.4968, and we’ll provide you with more information and how you can get started with a custom piece of material handling equipment.